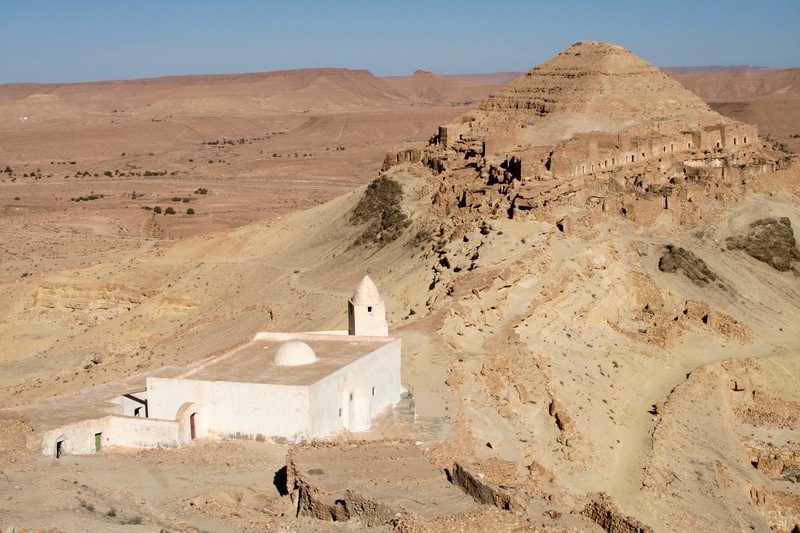 Of all the unearthly places I visited in the southern Tunisian deserts, the ghostly Berber village of Ksar Guermessa has to count as the most haunting. 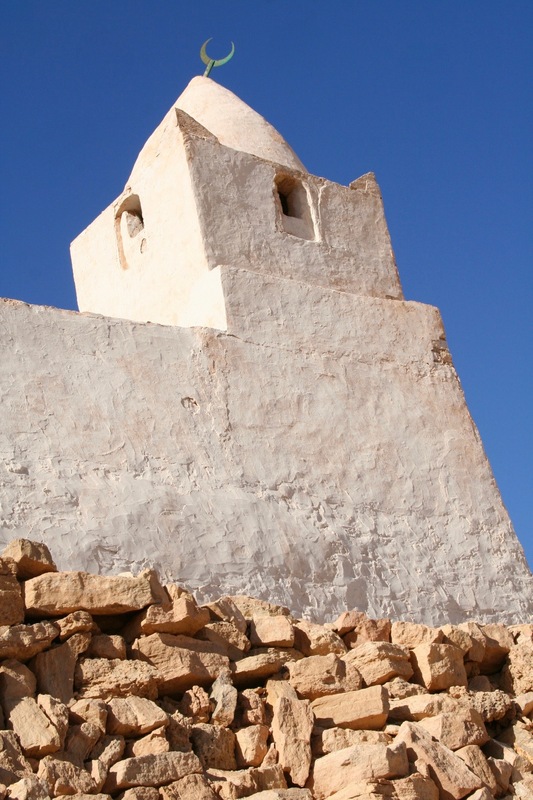 Founded sometime in the 12th century, it was fortified in response to the growing threat from Arab invaders, and it shares similarities with many of the other Berber hilltop villages in this area: fortified granaries built on top of an original troglodyte settlement, and a brilliant white mosque burning bright in the brown, dusty landscape. As you approach Guermessa, it’s hard to even tell that there’s a settlement built on and into the hillside, and along a ridge stretching across the skyline. The old village is split into two hilltops connected by a ‘saddle’ where the mosque sits, and if it wasn’t for the telltale white of the mosque you’d be forgiven for not noticing the village amongst the unrelentingly scrubby landscape. I parked the car in a small car park and set off up the hill to explore the abandoned village. Not for the first time on this trip I found myself wondering where all the other tourists were. 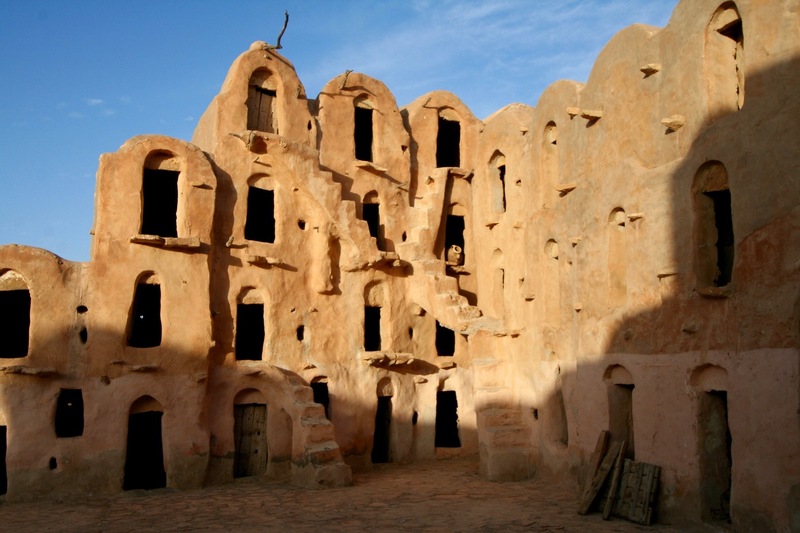 Here is an ancient village, easily accessible from Tataouine, that not only offers a glimpse into the lives of generations of Berber inhabitants, but comes with spectacular views. 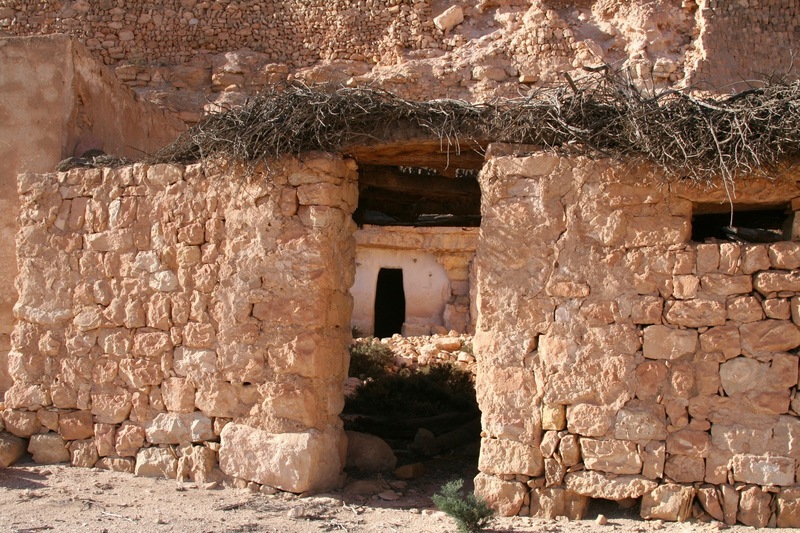 As I walked along the ridge I came across the troglodyte houses for which the village is famed. 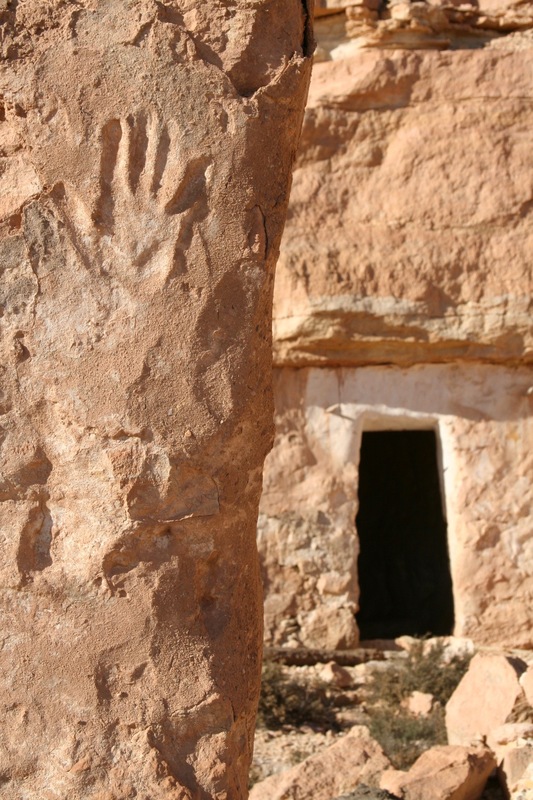 Each has a surrounding wall with a door into an inner courtyard, more doors then lead inside homes carved into the rock. It’s extraordinary. 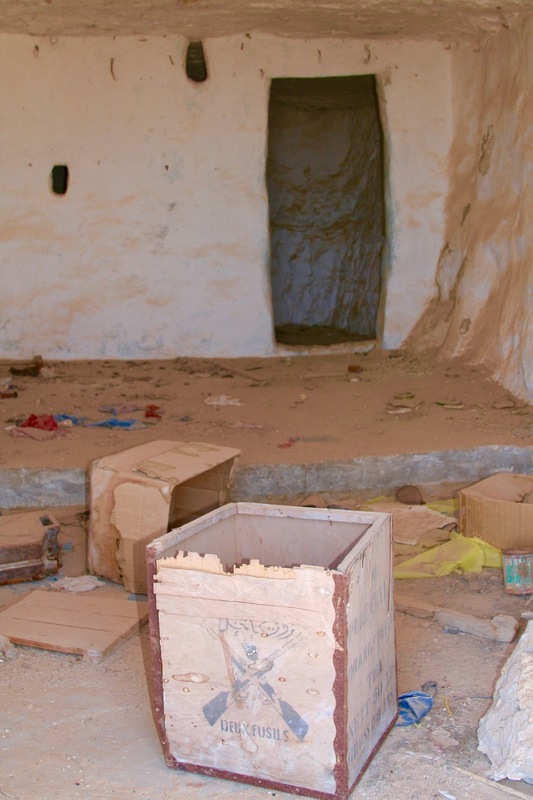 I literally got shivers down my spine as I entered these cave homes, the scattering of possessions that had been abandoned by their former inhabitants creating an almost supernatural atmosphere. The eerie silence amidst the ruins of a once thriving village was a surreal experience, and my imagination was conjuring all manner of dark and troubling illusions. I felt like I’d stumbled upon a place where the inhabitants had been forced to flee for their lives – I was expecting Morlocks to leap out from behind walls and drag me to the underworld. The reality is far more prosaic. I’d passed through the new village of Guermessa on my way here, and from the ridge where I was walking I had fantastic views of it and the surrounding landscape. The government had built a new village with running water, electricity, schools, hospitals and paved roads. People chose to leave their old lives behind and start afresh in the modern world. While I’m sure people are far better off in their new homes, it has lent an air of tragedy to the old village. 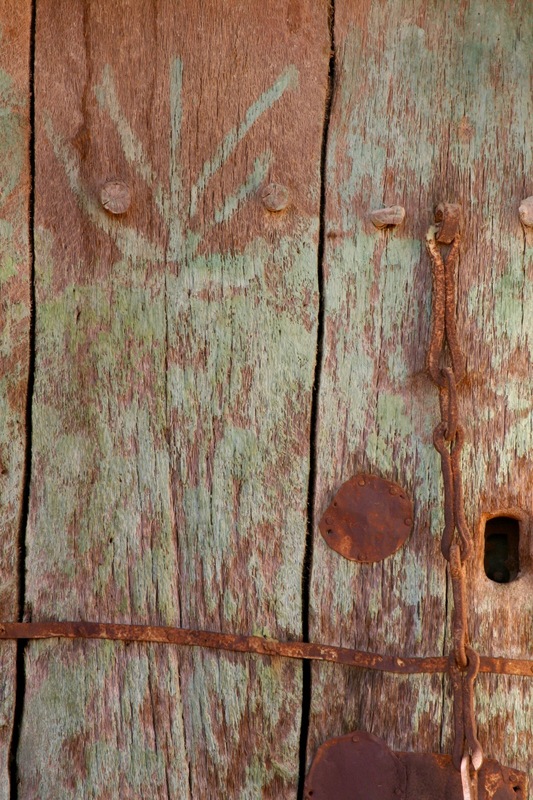 I walked the full length of the village and visited a dozen or so houses, noting the small details of inhabitation: palm wood doors stained green with metal studs, a hand print in the mud of a wall, old olive oil jars, a box that had once contained tea. 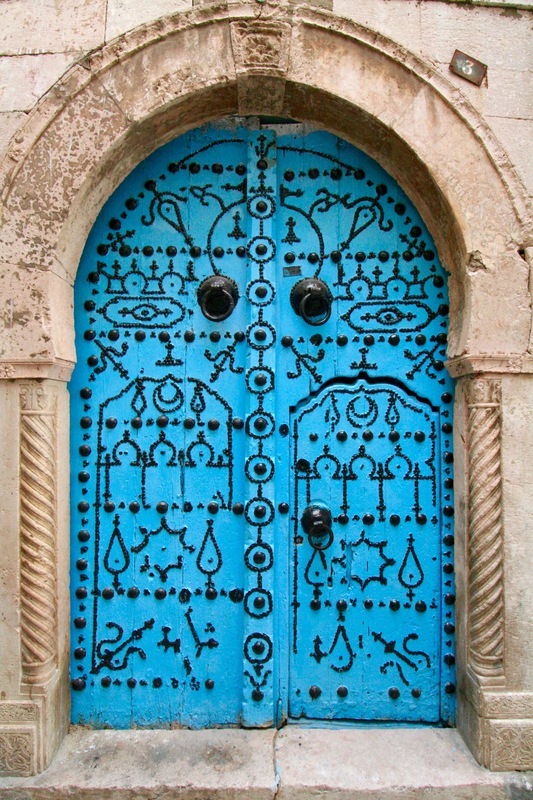 The women and girls of Guermessa were once famous for producing handmade embroidery, known as margoum. Woolen and brightly coloured, sadly the craft seems to be dying out in these communities, although you can still find it for sale. I made my way back to the mosque, drinking in the views as I went. I thought about visiting the other half of the village, but decided it was too hot and instead headed to the new village to see if I could unearth somewhere to have lunch. I was out of luck. 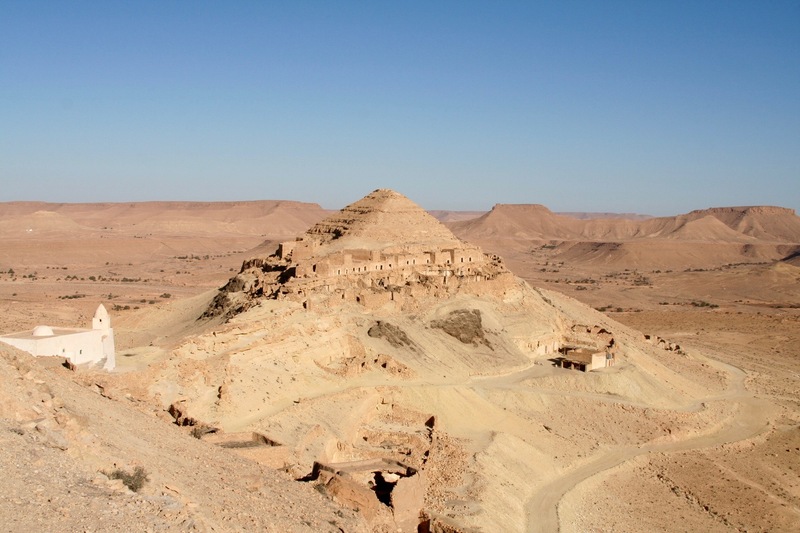 On my way back to Tataouine I spotted an unlikely sight, two dinosaurs striding across a nearby hilltop. After exploring the spectral delights of Guermessa, that didn’t seem so odd. It was early, still dark, as the taxi took me from my Tunis hotel to the airport close to what remains of the ancient city of Carthage. We drove in silence, as much because of language difficulties as the unsociable hour. There was no other traffic on the roads, and there was just a hint of sunlight on the horizon as a dark coloured van pulled out of a side street and slipped close behind us. The driver looked in his mirror and, with what can only be described as disdain in his voice, said, “Les flics”. It was like being in a French film noir. 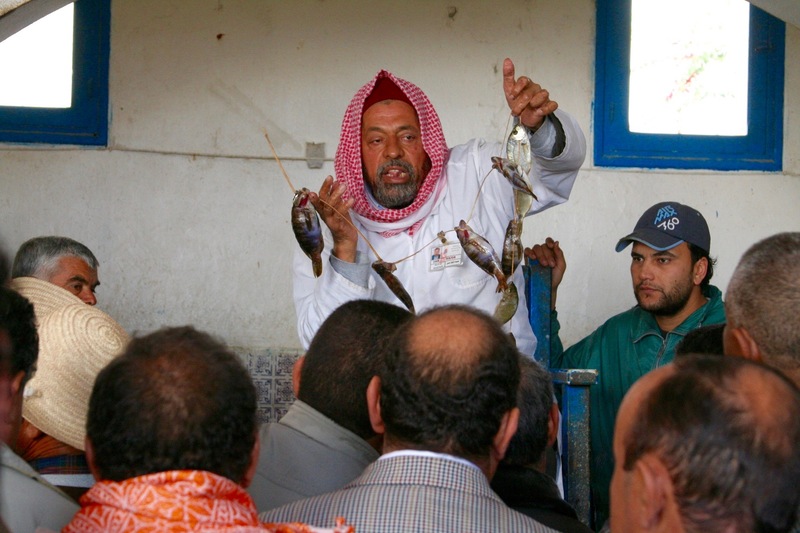 The police followed us for a couple of kilometres before deciding we were of no interest to them, and I was deposited at the airport to catch my flight to the famed island of Djerba. After spending several days in Tunis at various meetings, I was escaping to explore the other-worldly landscapes and cultures of southern Tunisia. There’s a good reason that this is where the Star Wars films were shot, it’s an extraordinary place that really does feel like another planet. 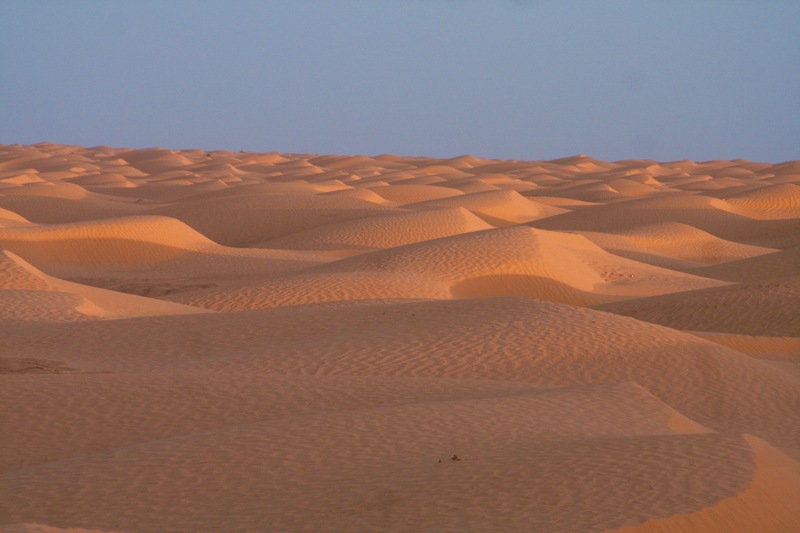 I had a vague plan involving picking up a hire car in Djerba and plotting a course south and inland towards Tataouine – Star Wars references are everywhere in this area. 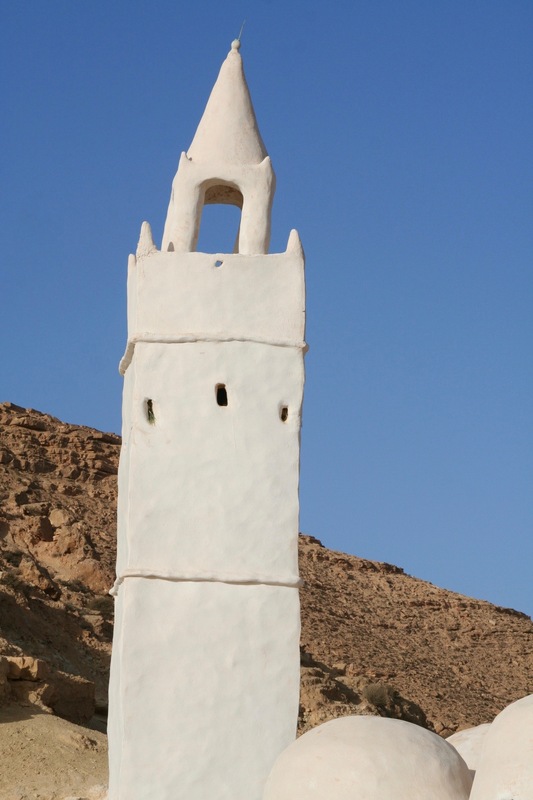 This is Berber country, their unique culture and history can been seen dotted throughout the region’s landscape. 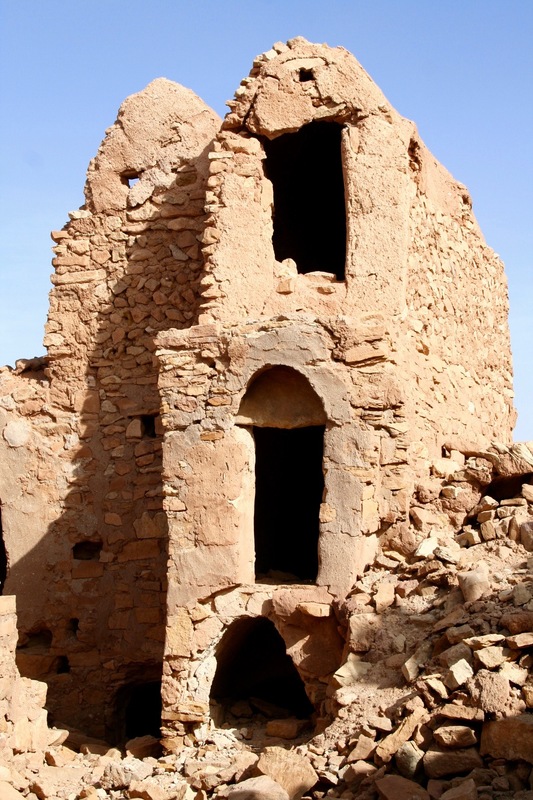 In particular, the fortified granaries and villages known as ksar, although often referred to as ‘Berber castles’. Their striking architecture makes them a ‘must see’, but since they merge seamlessly with the landscape that’s easier said than done. The extremes of living amongst these beautiful and severe landscapes have meant the human population has had to adapt to survive. 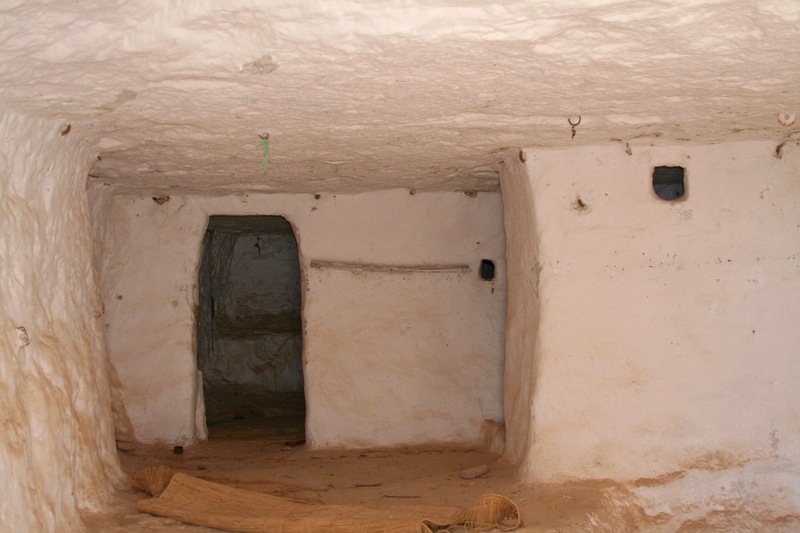 Here you’ll find underground cave dwellings and caves hacked from rugged hillsides. Homes designed to be cool in the ferocious heat of summer, yet warm in the bitter cold nighttime of the desert winter. Many of these traditional communities have now been abandoned for modern housing in ‘new’ villages a short distant from the original, but some still have inhabitants. At both Douirette and Chenini, as well as plenty of other smaller places, I’d find myself exploring alone. 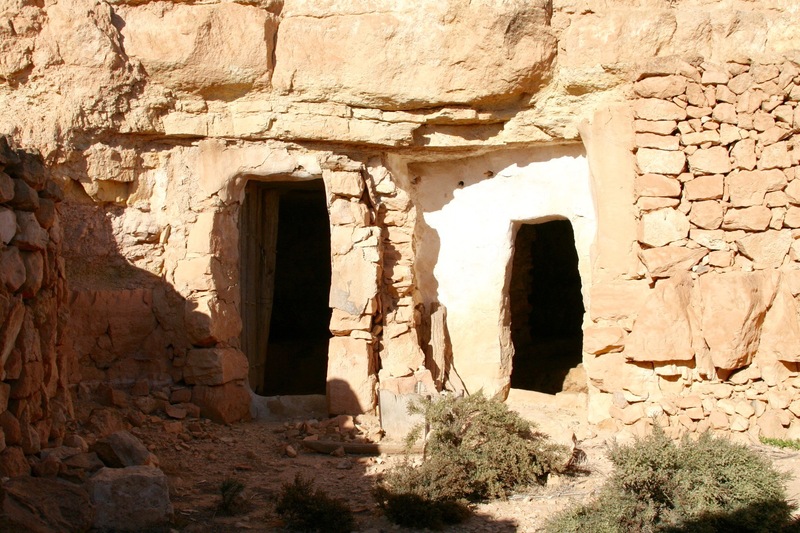 It doesn’t take much of an active imagination to imagine yourself as a latter day Indiana Jones; it was a little spooky at times, the quiet desert landscape accentuating every single noise as I nosed through abandoned homes. Without people, many of these former villages have fallen into ruin, but some, like Chenini, are being renovated with the hope of a tourist influx. 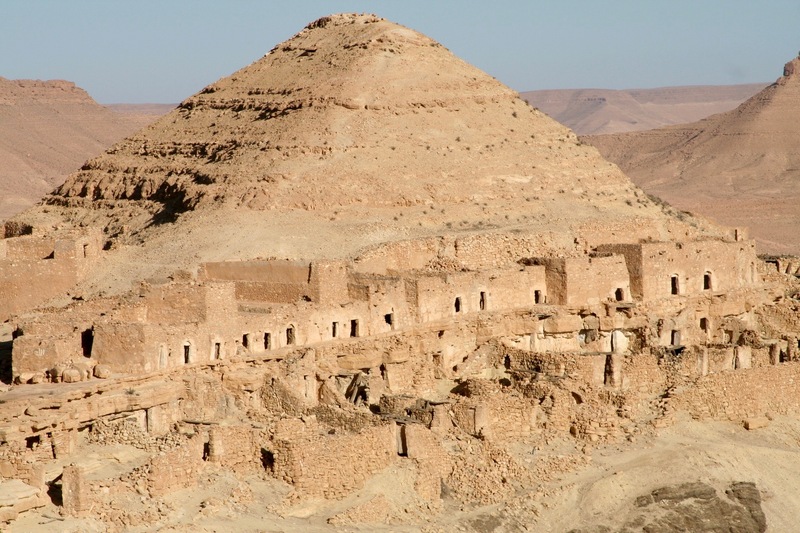 If these old Berber settlements weren’t atmospheric enough, on a whim I decided to experience a couple of days in the ‘real’ desert of the Grand Erg Oriental. 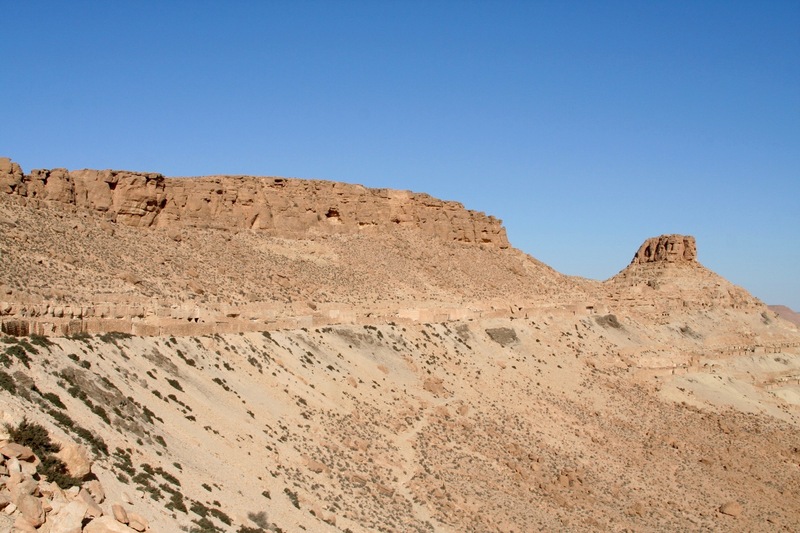 This vast sandy void of over 40,000km2 in Tunisia alone is part of the Sahara Desert, and home to Berber communities and oases. It has to be seen to be believed, and was probably worth the freak accident that saw me crash my hire car in the desert about 60km from the town of Douz. Happily, I was able to walk away from the accident with the help of three Tunisian men who had been camping in the desert. The same could not be said for the car, which was towed back to Djerba to be used for scrap metal and spare parts. 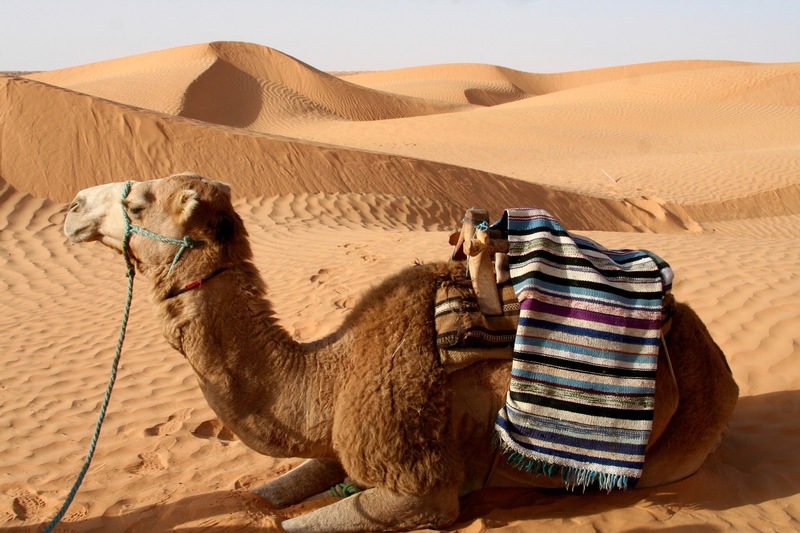 Apart from the shock of the accident, it meant I was stuck in the desert without my own transport 500km from where I needed to be get my flight back to Tunis. 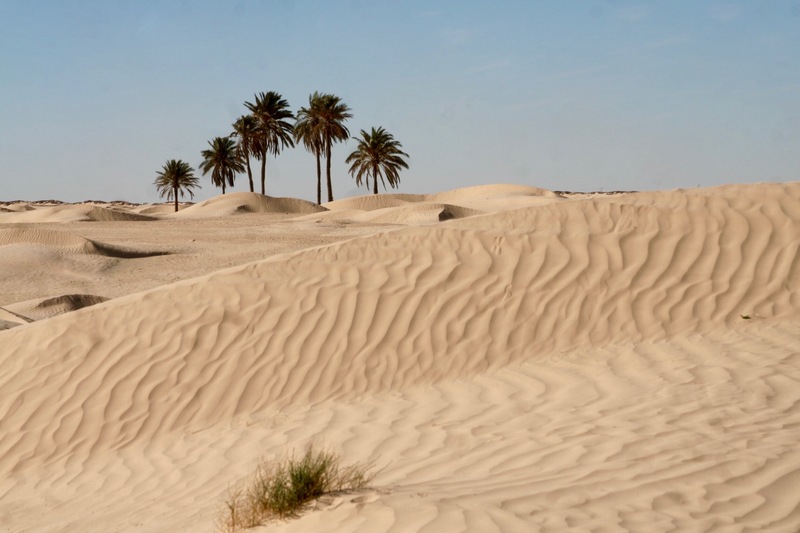 I found a driver willing to take me to the oasis of Ksar Ghilane and then on to Djerba. 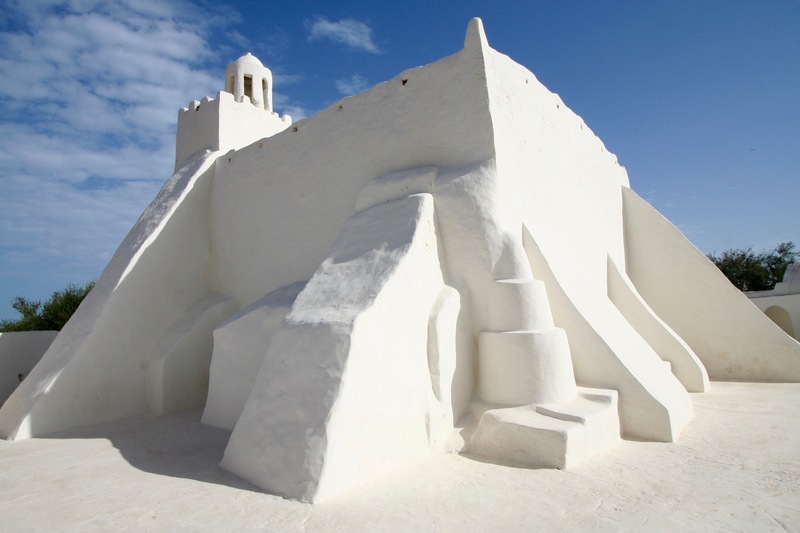 Rather than spend time on Djerba at the start of my trip, I planned to have a refreshing couple of days on the island on my return from the heat and dust of the desert. The car crash had put me behind schedule. In the end, I only had a day to explore this attractive place. 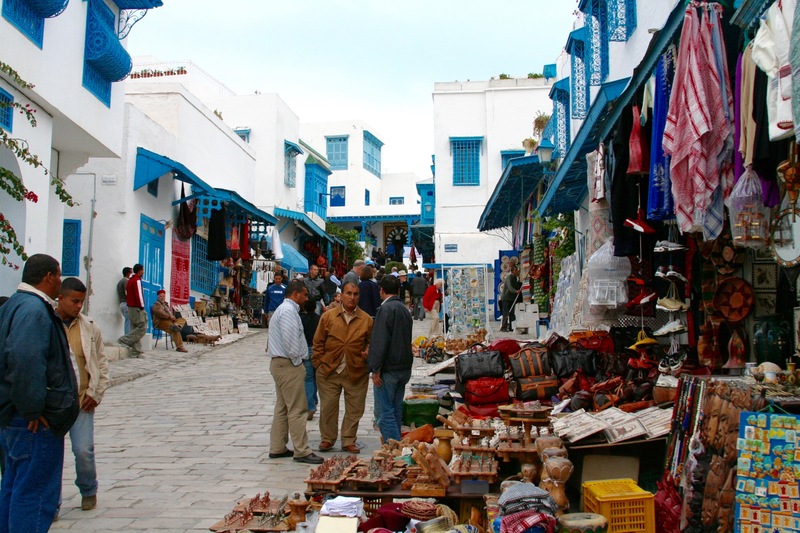 It was a shame, but my flight back to Tunis was booked and time had run out. 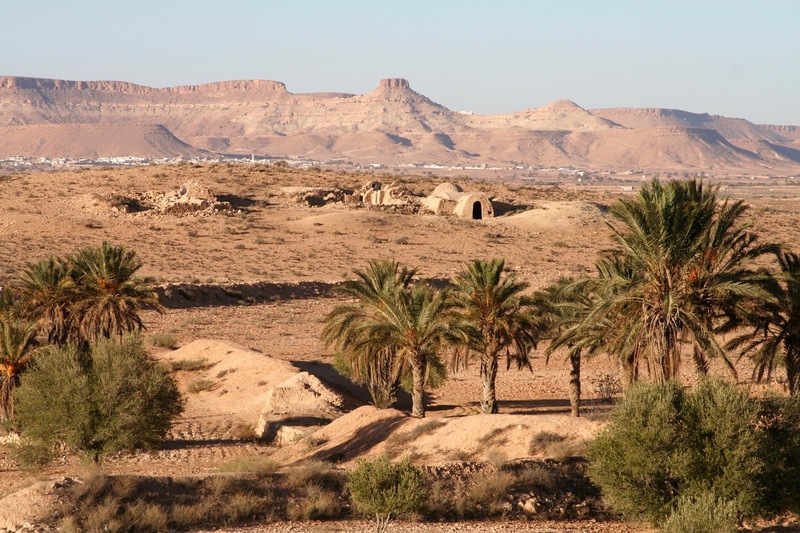 The beguiling landscapes and friendly people of southern Tunisia will remain with me for a long time though.